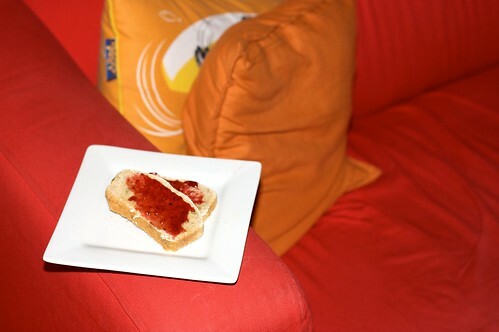 I took photos of our trip to Chat for Tea, but they've since disappeared! ETA: I found them! This post has been updated to include them. In Ballarat, we managed to locate Chat for Tea, a vegetarian tea house. Quiet but with most of the tables full on a Wednesday night, Chat for Tea's walls were lined with tea pots and little paper bags filled with tea, and is more of a tea house than a restaurant. The menu is not extensive but it is of a nice size. 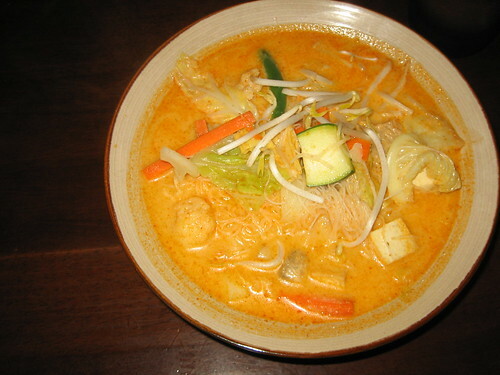 The focus is on various key Asian dishes, like laksa, udon, and some generic rice dishes. I tried the laksa, D tried the nutty rice, and we shared a serve of mock chicken drumsticks. The drumsticks were fantastic. The laksa and the nutty rice were okay, but a little bland. The prices were quite cheap, and we took home some sencha which was delightful. I love baked goods so much, and it is always a huge delight to go somewhere and buy baked goods, rather than having to bake them myself. As we were leaving Castlemaine we passed through Daylesford, and thanks to Miss T's post we were totally prepared to go looking for Himalaya Bakery. Hanging out with a friend in Castlemaine the afternoon before, she'd let us know that Daylesford was empty during the week and chockas during the weekend, so as we were there on a Wednesday we figured we'd be fine for service. And we were! What we weren't prepared for was the unbelievable cold as we got out of the car. It was so cold D stopped to buy a new jacket! And we were super glad we had our scarves. 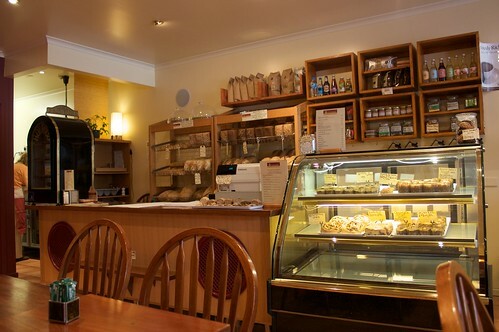 We found Himalaya Bakery, and hurried inside where it was nice and warm and bready smelling. After the oddest miscommunication ever, we established that we'd like an apple scroll, something coffeish, and a hot chocolate. 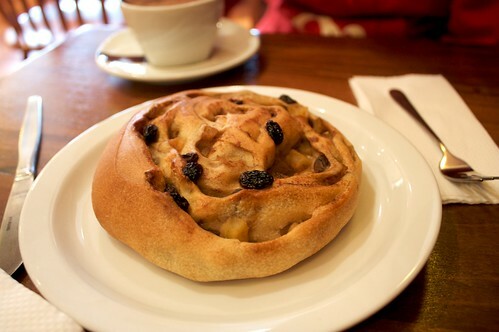 We shared the apple scroll, as I was still very full from breakfast (B+Bs are the best), and it was so exciting to have an apple scroll, for the first time since we went vegan. It was delicious! The hot chocolate also was pretty good. Warmed up and filled with delicious apple scroll, we purchased one of everything else that was vegan in their display window for later travelling noms. 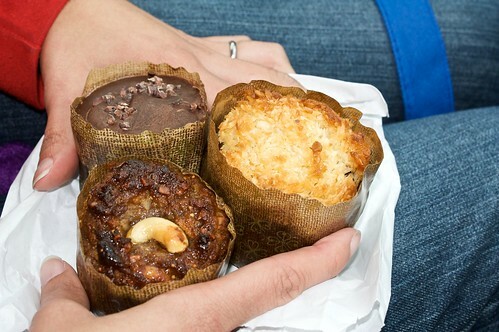 This ended up being three muffins: fig and sultana, coconut and apple, and chocolate. These were all pretty tasty, I think I liked the coconut and apple the best, and it was great to have some sweet treats later in the day when we were cold and hungry from wandering around at Sovereign Hill. I would love to go back to Himalaya Bakery and give their breakfasts a go, but perhaps again on a weekday. These posts are all terribly out of order! Had a great meal at the EBC last time we were in Melbourne, but sadly was too full to partake of the all-vegan desserts. With the RBP winding up just after five, and the drive all the way back from Belgrave, we were hungry by the time we hit Brunswick, and we all met up at the EBC for some very slow service. 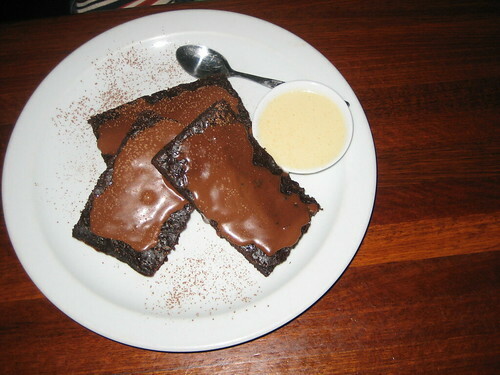 It took forever for some meals to arrive, and my dessert took about 45 minutes, but it was very delicious, and it did give me time to make room in my tummy for the tasty mint and choc chip brownies. 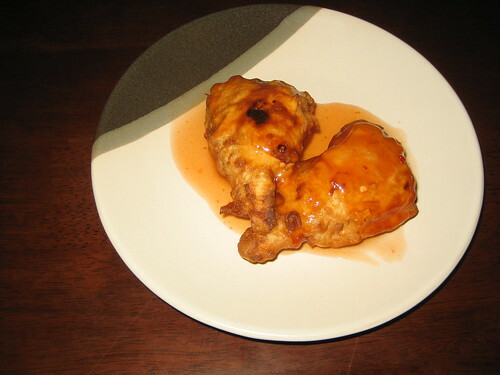 They were a little bit warm, and covered in a sweet sauce, and they were totally worth the wait. D had a slice of cookies and cream cheesecake, and was super super happy with it, though it was a bit too sweet for me. On Thursday D and I were excited to venture off on our own to meet up with some awesome Melbourne vegans and vegetarian bloggers! We congregated at the house of Michael and Cindy, and slowly a bunch of delightful vegos trickled in, bringing some delicious food for a vegan potluck, Indian-themed! 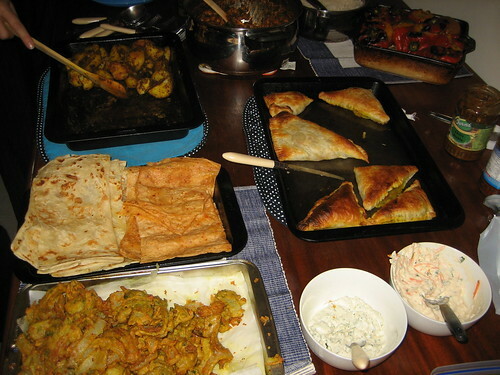 There was some really great food, samosas and stuffed capsicum and a lot of spiced potato dishes, which was pretty great. There were also some sweet desserts. The samosas, which were more like puffs but were super tasty, were fantastic. The capsicum was stuffed with something orange, I think perhaps pumpkin. There was also some onion bhaji, and some delicious yoghurt things. The naan was storebought but really tasty! And there was something that might have been a chana masala. Sadly I cannot remember who brought what. Philippa though has managed to remember more details here. Desserts were awesome, there was a kheera by Philippa, and some biscuits made by Cindy, and a carrot halwa that I think was made by Kristy. See I remember the important things! Cindy and Michael's apartment was awesome, thanks for letting us check out your photo wall and wander through your place! The conversation was great too, though we kept getting stuck talking about bikes! It was such a great evening, and it was very exciting to meet so many cool veg*ns! Yesterday before venturing out to the beautiful RBP of my darlings SJ + Essie, we wanted a hearty breakfast, so I made pancakes for breakfast for D, DB, J and myself. It took over an hour, and was a group effort to assemble, so I'm glad we all woke up early. As it was we only just had enough time! I vaguely used the recipe from vegan with a vengeance, working from memory. I couldn't find their baking powder (because they keep it in the fridge!) so I just dropped it from the recipe. Still turned out okay, though! Kept the stack warm in the oven as I went. 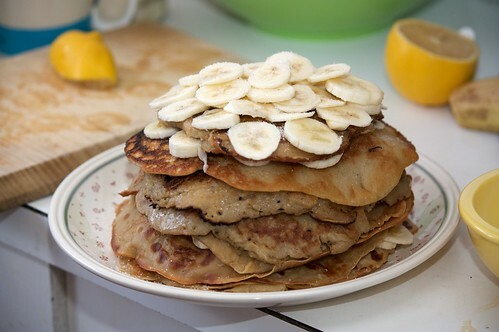 The stack was layered pancake, banana slices, white sugar, and freshly squeezed lemon juice. We worked using a production line, and cutting it was also an operation involving skewers and a delicate balancing act as we sliced this superb stack into quarters. Heading back to Melbs again tomorrow, and we're spending a few days adventuring. Does anyone have any recommendations for the Yarra Valley, Bendigo, Castlemaine, Ballarat and associated areas in terms of foods? I'm at Swancon today, and it's a short walk from my house so I have popped home for lunch. I had some Hokkien noodles in the fridge, and a tomato going soft and some wilting bok choy, so it seemed like the perfect opportunity for a very quick mee goreng. And there is enough left over for breakfast tomorrow yay! I also baked the chocolate and raspberry cake from Vegan Indulgence, with some modifications to gluten-free it up, which is sitting in R + K's hotel room fridge. It was really great, when I was wandering around with my cake tin under my arm this morning, to be able to reassure someone who said "I can't have any, I'm vegan" that yes she could! Yay cons! I know I only recently said that I try not to eat mock meat too often, yet here I am, again posting about fake meat! Char siu rice is simple Chinese cooking, fast and easy and tasty. I've served it here with soup, bok choy and carrots in a garlic soy sauce, and on a bed of cucumber and tomatoes. 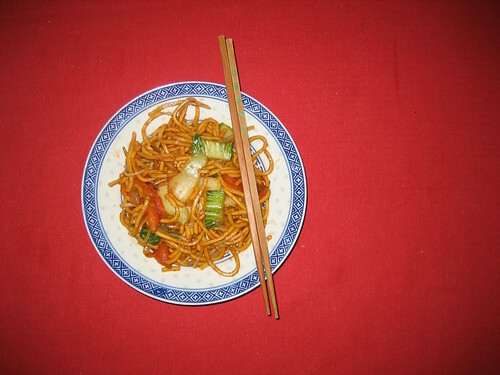 The little bowl is chilli and soy sauce, a spicy but delicious condiment. I've never made char siu rice on my own before, so it was a bit exciting to serve this childhood favourite. Super tasty! The important thing with char siu rice is to make sure the rice is cooked with stock, not water. A centimetre or two worth of fresh ginger, shredded, should also be added to the rice whilst it is cooking. This adds a really excellent flavour to the rice. Don't serve the char siu on its own, it is best to be plated with cucumber, or tomatoes. My favourite thing about char siu rice is scooping out the soup and pouring it, one spoon at a time, over the rice. To make the soup, bring the water to a boil, add the remaining ingredients. Reduce to simmer with the lid on for half an hour. Remove bok choy and carrot, remove from heat. 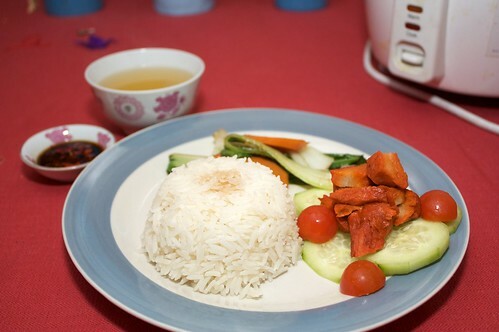 To make the rice, mix two cups of the soup with two cups of rice, add the ginger and leave to cook for the usual time. Prepare the char siu (oven or microwave to heat/defrost), and plate. On our recent trip to Melbourne I picked up Aduki's Soup for All Seasons, written by the mob from Las Vegan. 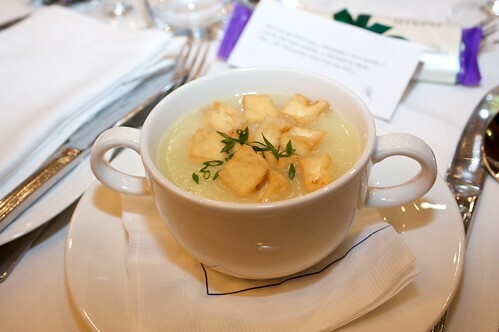 I was fueled by the soup obsession ignited by the leek and potato soup at R+K's wedding. D whipped this up whilst I was at my German class, and it was (soooup-er) easy and delicious. 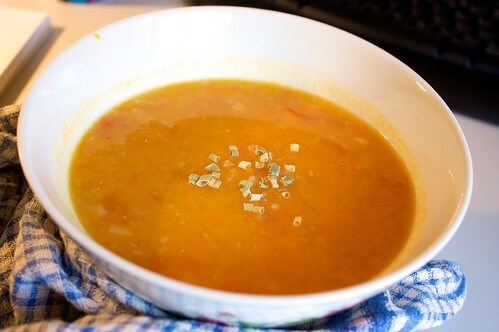 It is the second soup we have tried from this book, and so far we are definitely two-for-two delicious. Only notes for it are that we mashed in the pot instead of blending/processing, leaving it still a bit chunky. Our friends K and R got married on the Ides of March, which was a super hot Perth day, and we were all standing in the sun in Queens Gardens and I forgot my parasol, which was a bit boo. The reception was at the Hilton in one of the rooms there. There were h’or dourves to start with, one of which we could even eat (tiny fruit kabobs), and some which we couldn’t (FAIRY BREAD). This was followed by a sit down buffet, however us vegans were instead served a three course menu of deliciousness, so delicious that I didn’t feel a need to go peruse the buffet for baked potato products (with which I am frequently obsessed). We started with a potato and leek soup. This was creamy and flavoursome, and topped with puffed tofu. I was really impressed with this soup, and this was actually what triggered my current soup obsession. This was followed by a filo parcel filled with sweet potato and sundried tomato. This was fantastic! I really want to replicate it. 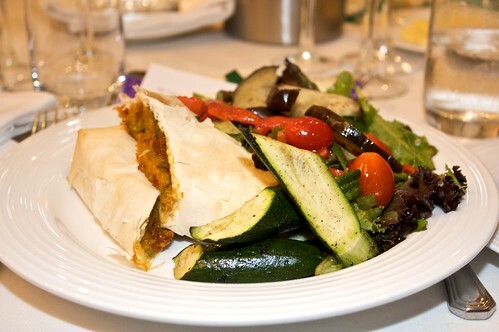 The flavours of the potato and the tomato worked well together, and I love filo pastry. The filo parcel was accompanied by a terrible side salad, but by this point we had already started dancing (the idea was that dancing continued throughout the meal, as everyone was eating staggered due to the buffet), so we’d swung to In the Mood between the soup and the main, and as a result weren’t hugely hungry. 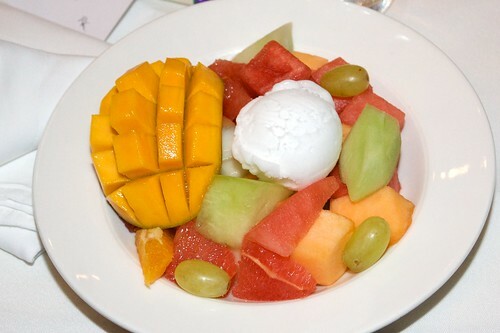 Dessert was a giant fruit salad and lemon sorbet. Mad props to the chef, our meal was fantastic. The food up at the buffet sounded delightful (in a non-vegan way), and the three vegetarians at our table were delighted with the spread, but the vegan options we received were awesome, would nom again. Also our bonbonniere was vegan chocolate! The Sweet William purple bar. I am always so pleased when our friends are so awesome at remembering us and providing for us. This photo does not do justice to the size of my latest loaf of bread. Being on a bit of a bread kick, and loving the wholemeal and seeded breads as we do, we thought we'd give wholemeal bread a go. The first rising seemed to go like normal, but the second rising, whilst normal in duration, did not proceed as high as usual, and after an hour and a half I gave up and threw it in the oven. It was still tasty! Just very, very small. Does anyone have any ideas why this might have occured?